Former president Noynoy Aquino and Mar Roxas were present when the APO - Cemex plant was inaugurated in 2015. According to residents of Naga City, APO cement has operations in the area where the killer landslide happened. 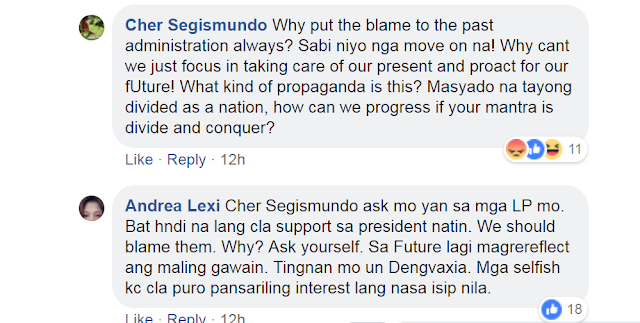 Despite Geologist reports saying that the fissures on the mountain that caused the landslide were not due to mining activities or from the quarrying operations by APO-Cemex plant, residents in the area believe otherwise. They said that there were many typhoons much stronger than Ompong before, but it did not cause any landslide. It was only after the quarrying operations of APO cement that the state of the mountain started to deteriorate. Coincidentally, former president Aquino and Mar Roxas were present during the inauguration of the APO-CEMEX plant. Although it is not for us to judge on who’s to blame for all this, there are questions that needed to be answered. Why did it happen? How did it happen? And what should authorities do to avoid it from happening again? According to reports, Naga City Mayor Kristine Chiong issued a stoppage of quarrying operation because of reports of cracks in the mountain. However, she received a letter dated August 29 from the Mines and Geosciences Bureau - region 7 (MGB 7). It reported that there were cracks and fissures in the mountain, but it did not pose an imminent danger to the community. Because of the report, she allowed the APO quarrying operations to continue. A few weeks after resuming the operations, the landslide tragedy happened. Are The Yellows Partly Responsible For This? A netizen narrated that they used to plant crops in that mountainous area in the 70’s. They own around 2 hectares of land there. During the late 90s, Cemex started buying the lands and started quarrying. In the year 2000, they were forced to sell their land because Cemex started quarrying their property without their consent. The governor during that time was Hilario Davide, a known yellow and the one who wrote the “Cory Constitution”. 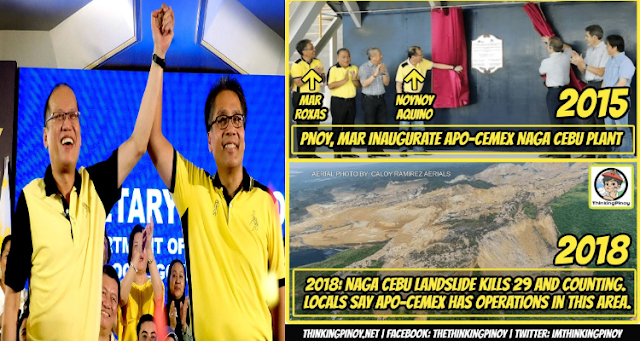 It’s no wonder that President Noynoy Aquino and Mar Roxas were invited to inaugurate the said killer cement plant. Here are some of the netizens reactions.